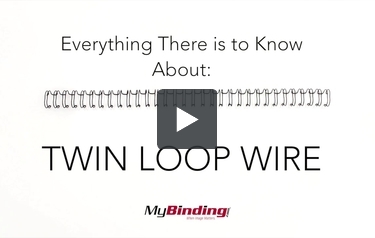 Enter the Bronze Age of Binding with bronze twin loop wire! These eye-catching binding supplies will make your clients remember you days after you hand them your presentation that was bound with bronze twin loop wires. And we have some high quality brands available, so they'll be sure to last: GBC, Renz, and our own brand. Choose from 3:1 pitch or 2:1 pitch, depending on the size of your project. The 3:1 pitch is used for sizes 1/4" - 9/16" and the 2:1 pitch is for sizes 5/8" - 1-1/4". We have available various lengths. But if you have a custom length, you should look into getting a wire spool so you can decide the length. Premium bronze 2:1 twin loop wire with a shiny finish. Premium bronze color 3:1 twin loop wire. Premium bronze color 2:1 twin loop wire. Classic bronze colored 3:1 wire. Classic bronze colored 2:1 wire.